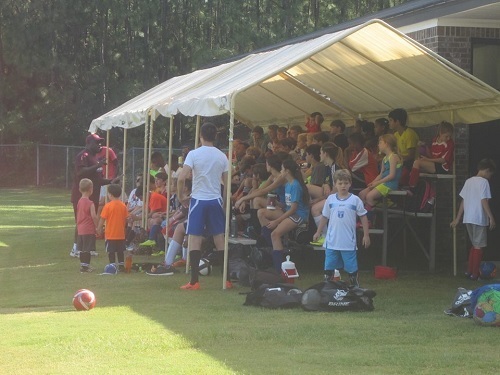 The Curriculum: The USC Aiken Soccer School is offered as a week long coed camp for ages 4-17. Our goal is to provide high quality soccer instruction in a safe, fun and socially sound environment. Each day begins and ends with assemblies to address and emphasize character building aspects of sport such as attitude, leadership, teamwork, discipline, responsibility, selfesteem, social skills, citizenship and competitive spirit. Day Camp: Full day camp begins at 9 a.m. and ends at 4 p.m. Please note that camp ends at noon on Friday. A swimming session is scheduled after lunch for those interested. Half-Day Camp: Half-day camp begins at 9 a.m. and ends at noon. This camp is geared towards the younger soccer player. Players will have the opportunity to attend a goalkeeper training session each day. The sessions will focus on catching, diving, reflexes, ball distribution and communicating with teammates. All campers should bring soccer cleats, shin guards, soccer ball, water bottle and sunscreen. Full day campers should also bring indoor soccer shoes or sneakers, towel and swimsuit. Other suggested items are a nutritious morning snack, bug spray and an extra t-shirt. Must bring waiver and medical information form. Click Here.